TGIF Everyone! Don't you just love Fridays! I do especially since I know that I do not have to go to work for the next three days. Welcome to the Digi Haven Challenge! For our second challenge, use a free floral digi stamp on your card. I found this cute flower image over at Little Scraps of Heaven Designs . I used my copic markers to color the image. I used a past sketch from Freshly Made Sketches for the layout of the card. 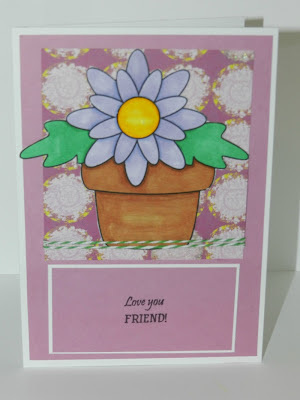 I used the So-So Sweet Paper Pack from Paper Studio. To add in some more of the green, I used the Peapod twine for some added embellishment. On the center of the flower, I added some liquid glass for some added dimension. Thank you for stopping by today! Don't forget to join us in this week's challenge over at Digi Haven!